The next student to be featured in our Student Spotlight series is Andrew Loggie, recipient of the ACS/City & Guilds of London Art School Undergraduate (BA) Prize in 2017. Andrew, currently in his third year of study, has received a £1,000 prize to support the development of his artistic practice during the final year of his undergraduate degree. 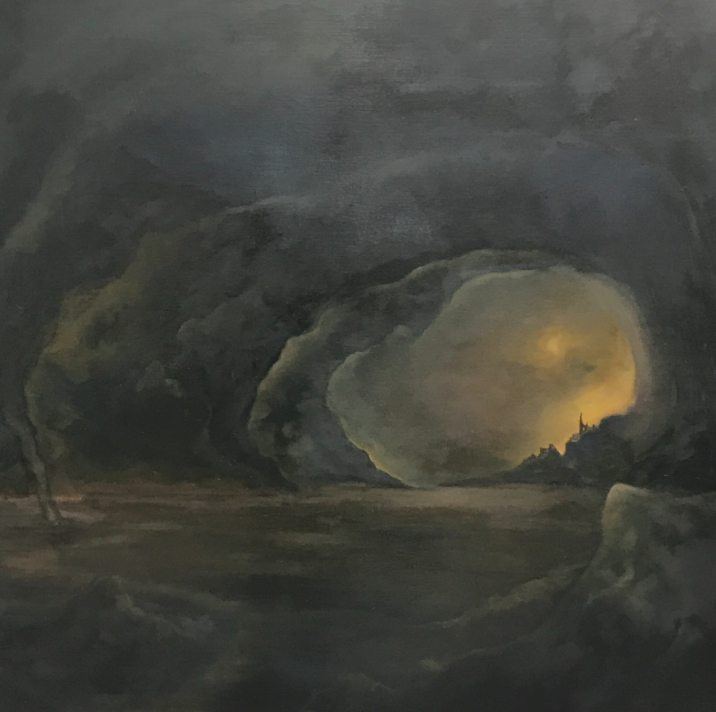 Find out more about Andrew's imaginative paintings inspired by landscape photography and science fiction. Q. What does winning the ACS/City & Guilds of London Art School Undergraduate (BA) Prize mean for you as an artist? Winning the ACS prize has been an encouraging experience and has come at an incredibly important time for me. Whilst I believe that you need to be the compass for your own work I think it can be easy to sometimes get too stuck in your head about whether your intentions are relayed to your audience in an effective and authentic way. It was a really pleasant surprise to have ACS take interest in what I am making and it re-affirms that creating things that are ultimately important to you is the best way to go about making work. The main aid that this prize will help me with is with materials for my third year. I have been working my way upward in scale through-out my second year at art school and have landed on the conclusion that larger scaled work will carry the best impact and finish for the type of subject matter I have in mind. In any case good quality canvas doesn’t always come cheap and given my large scale ambitions a few large stretchers and a roll of fine grain canvas or linen can be often like attaching a vacuum to the inside of your wallet so I am incredibly grateful for the monetary award. All throughout high school I was obsessed with black and white ink wash drawings and the balance of detail and tone that the medium gave you. Once starting my BA in Fine Art at City and Guilds of London Art School I had the opportunity of using oil paints and since then I have been engrossed in purely using oil paint for my work. I never really thought I would migrate so heavily to painting as I always saw myself to be more illustratively inclined but the potential and the real learning curve of oil paint; not to mention that the results in colour vibrancy and overall finish can be pretty awe-striking. I can say that I am definitely someone who, when is set on learning a craft, seeks to fully understand the technical possibilities of the medium that interests me. Growing up as a kid I was heavily interested in many things both sci-fi and fantasy; be it through films, dye cast models or the virtual environments of computer games – all of which has filtered into my imagination over the years . Fast forward to now and I feel that I am more involved in the genre than I have ever been – with my practice looking at the fusion of science fiction with both classical painting and art history. I feel I take most of my inspiration from other paintings be it for their subject matter or execution. For me, seeing something that strikes a cord of interest or just the plain wonder for the technical accomplishment of a work really fires me up to make a painting. Outside of paintings of interest I widely source a ton of landscape photography which often serves as a reference point/initial inspiration for what I could morph it into. 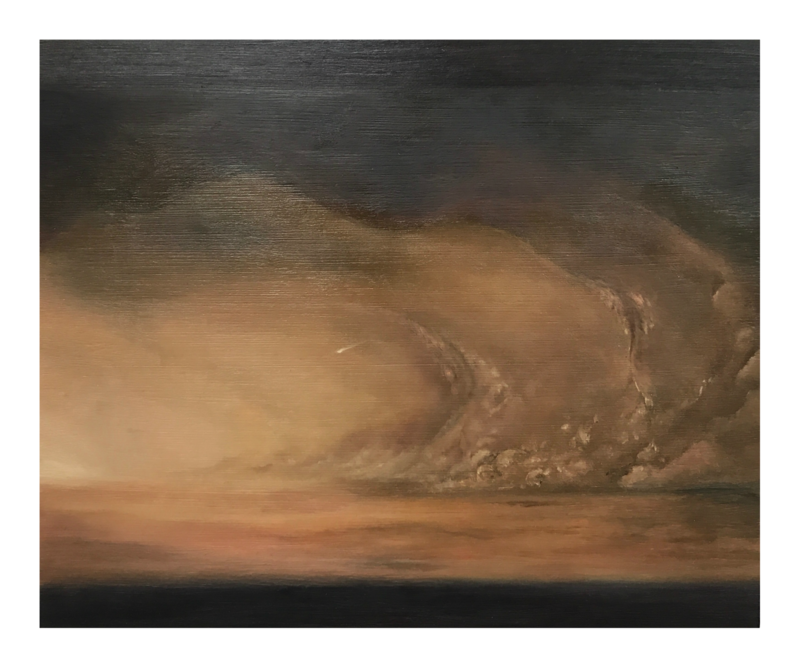 The deciding factor of what to paint for me comes from a strong desire and sudden liking to a particular image in my head that is generally in response to another painting or a physical landscape that has grasped my interest. Crucially, I need to feel pretty strongly about the core idea or image that I have if I am to really stand a chance at seeing the work through and finishing it to the best of my ability. Following on from identifying the core idea/image I will often make really loose thumbnail sketches to encapsulate the essence of what I am thinking of depicting. The next stage lies with finding appropriate reference material and this can sometimes be a time consuming one. I will first seek to zero in on other artists work that share similar themes or visual techniques that I can poster around my studio for guidance. I will similarly trawl through a bunch of reference photos to help me construct my desired painting. As I often deal with a blend of real world and fantastical imagery much of the photographic material will serve as framework to aid me in the creation of fictional subject matter – of things that simply do not exist in the real world. After collating my material I will begin with preliminary sketches and colour studies. These works are fast paced studies that purely serve the purpose for me to decide on composition, colour and scale. Once I am set on a concept, my reference material is up on the wall and my canvas is stretched and primed I will begin painting. This is quite a routine process and does not differ too greatly between works, although despite all of the planning you can do for a painting it never is quite enough to limit the inevitable complications that will arise – but I think that is just part of making anything quite frankly! This is a tough one to pinpoint actually, but I do have vivid memories of when I was pretty young drawing a bunch of fictional characters/creatures from my own imagination – quite often inspired by Star Wars and Lord of the Rings. Not exactly a work of ‘art’ but is definitely part of the roots for my interest in the matter of sci-fi and fantasy. My whole fascination with fictionally created worlds has been rooted in my love of cinema. I think just from the various ways that fantasy lets you warp and examine the world in quite abstracted ways can give rise to some really interesting concepts to work with. Congratulations to Andrew! We look forward to finding out more about how the City & Guilds of London Art School Undergraduate (BA) Prize has helped his practice in 2018.